Residents in Ireland are taxed on their worldwide income. 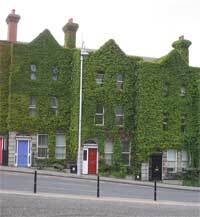 Foreign individuals become residents if they are present in Ireland for more than 183 days in a year. Married couples may elect to be taxed jointly or separately. The tax year in Ireland had been aligned to the calendar year as of January 2002. Residents are taxed on all types of income. Income is classified into different categories according to their income source. Taxable income is generally an aggregate of all types of income. Deductions, allowances and credits may be applied before income tax is imposed. Different rates apply for single individuals and married persons. Residents are entitled to numerous tax credits and deductions. The Irish Tax & Customs have more details on tax credits and deductions available to residents. Rental income is taxed at the standard income tax rates. Taxable income is calculated as gross rent less income-generating expenses. Allowable deductions include ground rent, rates, maintenance costs, general repairs, insurance, management fees, service charges, advertising, accounting fees, depreciation (wear and tear), building expenditures, and interest. Stamp duty rates on property leases range from 1% to 12%, which is levied on the average annual rent reserved by lease. The applicable rate depends on the length of the lease. Stamp duty rates range from 0% to 6% on premiums on leases of land and other real property. Capital gains tax is imposed at a flat rate of 33%. Taxable capital gains are generally computed as selling price less acquisition costs, adjusted for inflation, and improvement costs. The first €1,270 of capital gains is exempt from taxation. Gains from the disposal of a taxpayer´s primary residence are also exempt. Stamp duties are levied on sales of residential properties. The rates range from 0% to 9%, the applicable rates depend on the property value, property size, and the status of the property buyer. Local property tax is levied at different rates, depending on the value of the property. For properties that are valued at least €1,000,000, local property tax is levied at a flat rate of 0.18% on the first €1,000,000, and at a flat rate of 0.25% on the property value exceeding €1,000,000. For properties that are valued €50,000 up to €1,000,000, a different local property tax rate system applies. Income earned by companies is subject to corporate income tax at varying rates depending on income classification: 12.5% on trading income and 25% on non-trading income. Capital gains tax earned by companies is subject to capital gains tax at 33%.